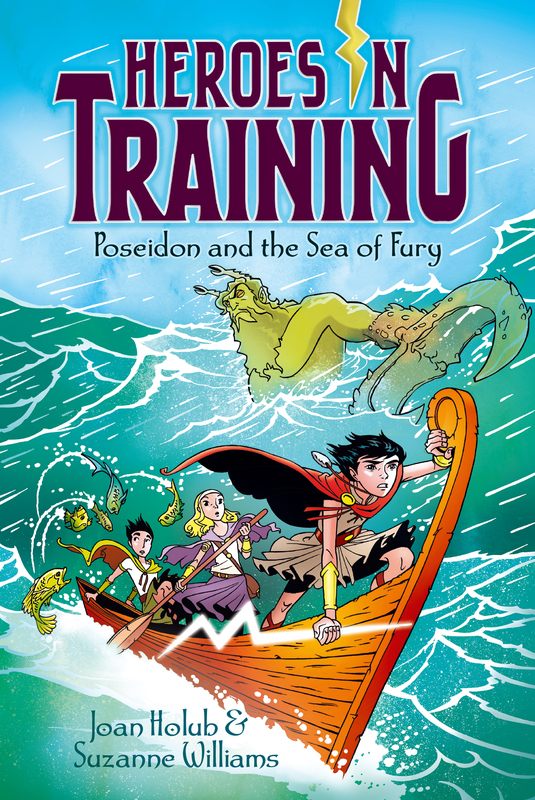 A young Poseidon must triumph over aquatic terrors in this Heroes in Training adventure. The merciless Cronus and his Titan buddies are in hot pursuit of Zeus, Hera, and Poseidon, who plan to travel across the treacherous boiling sea in order to save a fellow Olympian. They have a boat, but they also have a problem: Poseidon can’t swim and is terrified of the water (well, really of the creatures that lurk in its depths). The group faces danger after danger as they battle singing sirens, a fishy and ferocious Titan named Oceanus, and people-eating monsters sent by Cronus himself. Can Poseidon overcome his fears and help his fellow heroes escape Cronus and his cronies? A SPEAR WHIZZED BY TEN-YEAR-OLD Zeus’s ear. He ducked his head but didn’t stop running. Neither did his two companions, Hera and Poseidon. They were right behind him. “Halt in your tracks or you’re dead meat, Snackboy!” a cruel voice boomed. He’d know that voice anywhere. It was Lion Tattoo. That was what Zeus had nicknamed him, anyway. He was the leader of the three half-giants who were after Zeus. They were soldiers in King Cronus’s army and stood as tall as trees. Just three days before, they’d snatched Zeus from his cave in Crete and brought him here to Greece. He’d already escaped them—twice. But he might not be so lucky a third time. “When we catch you, we will eat you!” hollered a second voice. Blackbeard’s. Another of the half-giants. Then the third one—Zeus had dubbed him Double Chin—added his two cents. “Yeah! And we’ll chomp your friends for dessert! Ha-ha-ha!” He followed this up with a loud burp. A shiver ran down Zeus’s spine. They were probably bluffing, though. Their orders were more likely to take him, Hera, and Poseidon back to King Cronus. So that the king could swallow them whole! They approached a ditch. Zeus jumped in and hunkered down, waiting for Hera and Poseidon to catch up. Within seconds Hera dropped in to crouch beside him. “We’ll never reach the sea at this rate. Somebody else is going to find that trident thingie before we do. Do something, Thunderboy!” she hissed. Zeus liked the nickname she’d given him. But she sure did know how to make it sound like an insult sometimes. An oracle named Pythia had sent them on this quest to search for a magical trident. Which was going to be a challenge, since none of them knew what a trident was. But they did know their destination—the sea.